COBALT has a new web address. I am very sad to tell you the news that our friend, Brian Malone died on August 2nd, 2014 after a short illness. 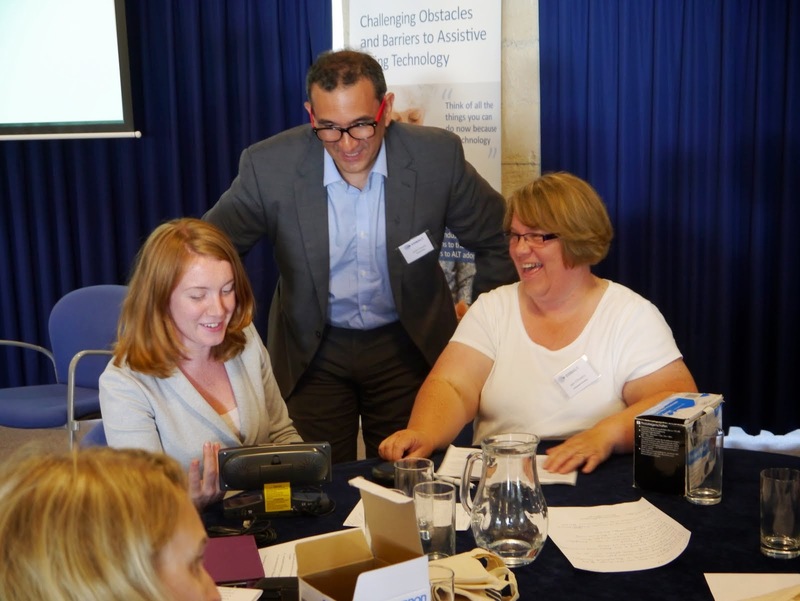 Brian wrote a very popular blog for the COBALT Project outlining his experiences of leaning how to use new technologies. Despite having a diagnosis of dementia, Brian lived a full life and was eager to learn new things and to talk about his experiences. Brian was an inspiration to us all and will be sorely missed. 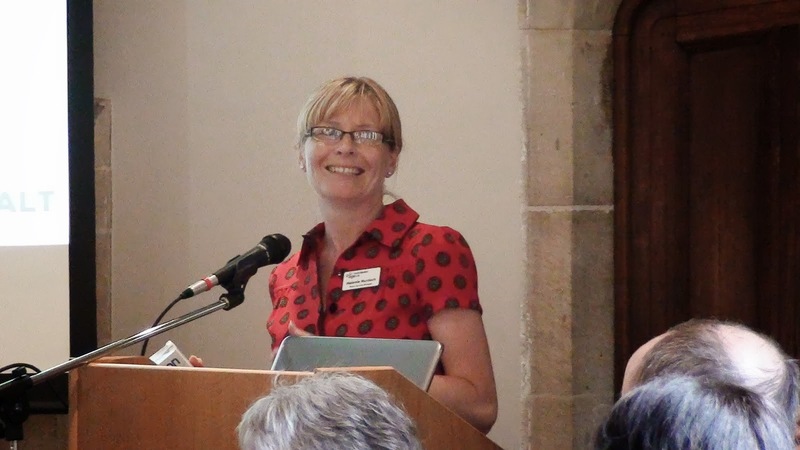 Prof Arlene Astell led our event at Swindon. Starting with an interactive session on discussed what makes people like or hate technology. 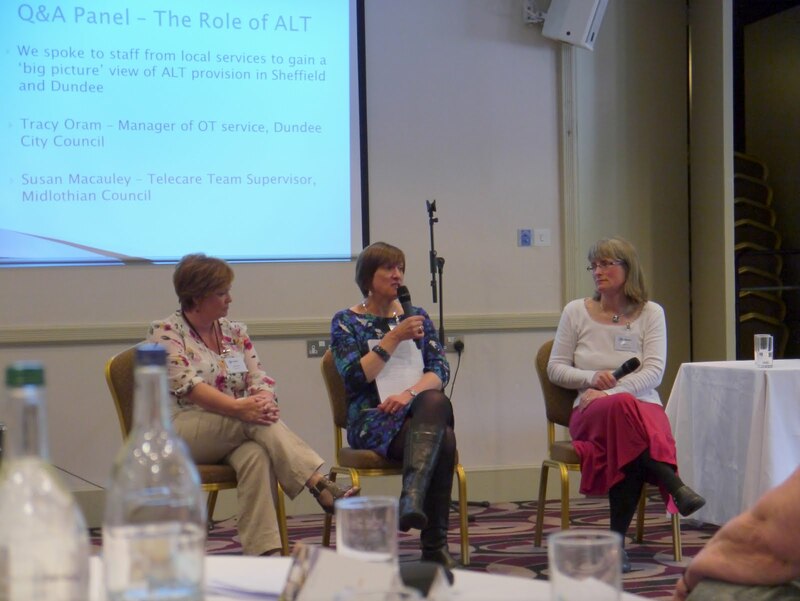 Arlene chaired a Q&A session with a local commissioner and telecare/health supplier. In pairs delegates investigated assisted living technology. and gave feedback on where it could be used. Several people said the procedures council’s used made it hard for people to get the right technology at the right time. However, sometimes a loud, vibrating alarm just makes everyone laugh. Swindon was the last of the events (see below for Cambridge, Edinburgh and Sheffield). We will be publishing our findings later in the year. 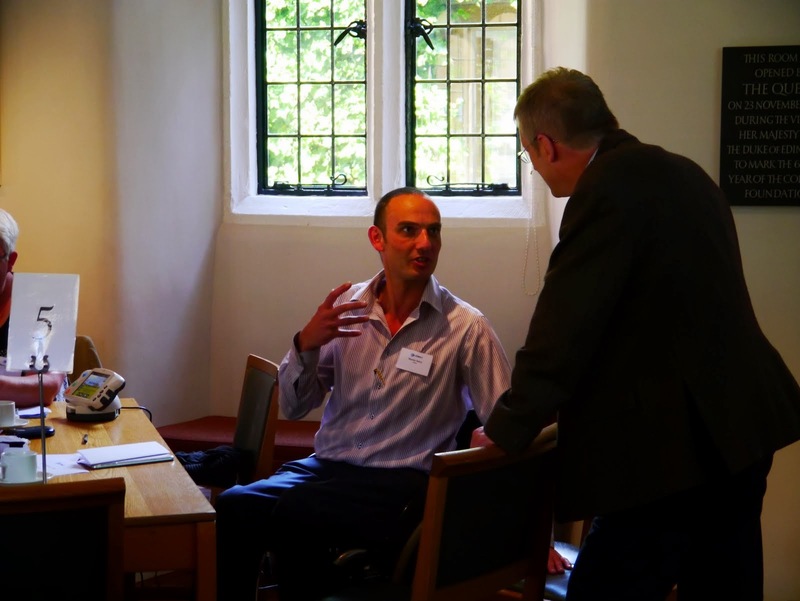 Trinity Hall, Cambridge was the setting for our assisted living technology event for the East of England. 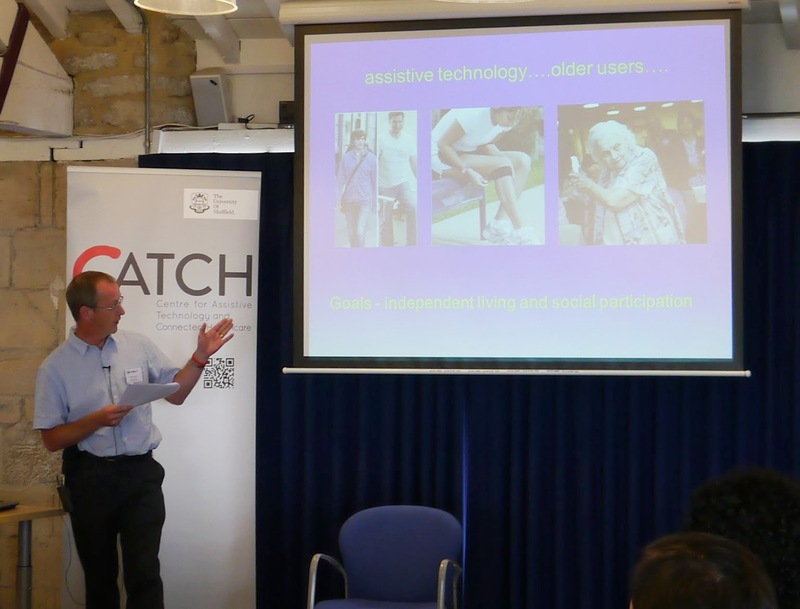 Prof Arlene Astell and the COBALT team offered insights about the adoption of technology to over 40 industry, academics, housing, health and social care professionals and older people. The day started with a visit to the exhibition of the best of inclusive Design from Norway and UK. We were privileged that Oystein Johnsen and Maja Arnestad came over from Norway for the event. Delegates – such as Martin Sabry from Aideas the inclusive design consultancy (seated) were welcomed to the college by John Clarkson. John is not only Vice-Master of the college but also Director of the Engineering Design Centre which has an international reputation for inclusive design. With such a range of delegates the feedback was lively and well-informed. 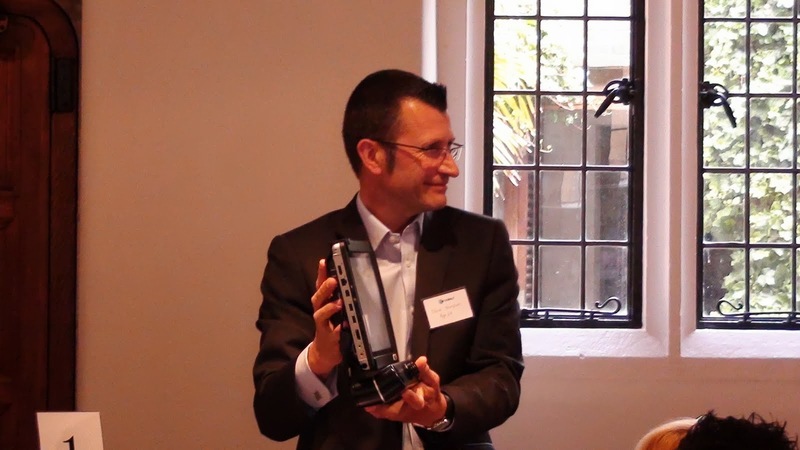 Compared to previous events where many devices were criticised this event had more devices receiving recognition for trying to apply inclusive design principles. 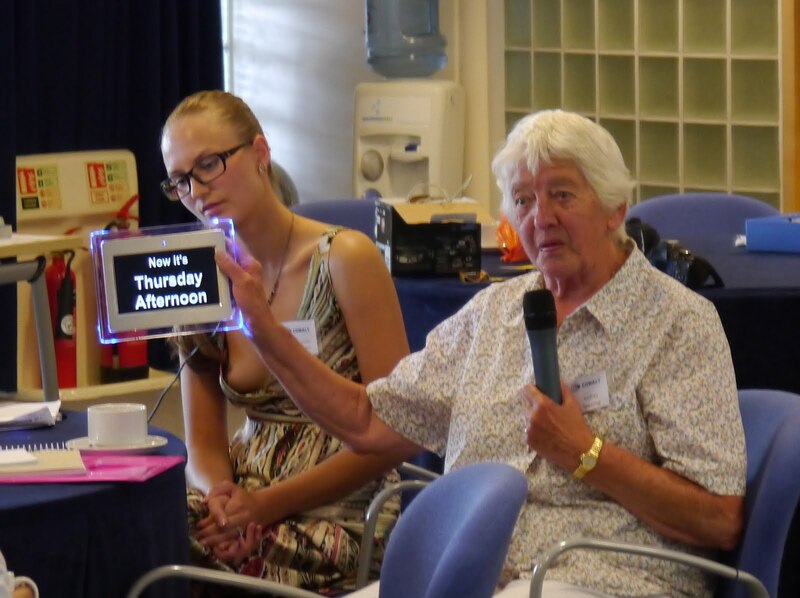 Delegates were not solely concerned with the problems of older people but could see many devices could help younger people. 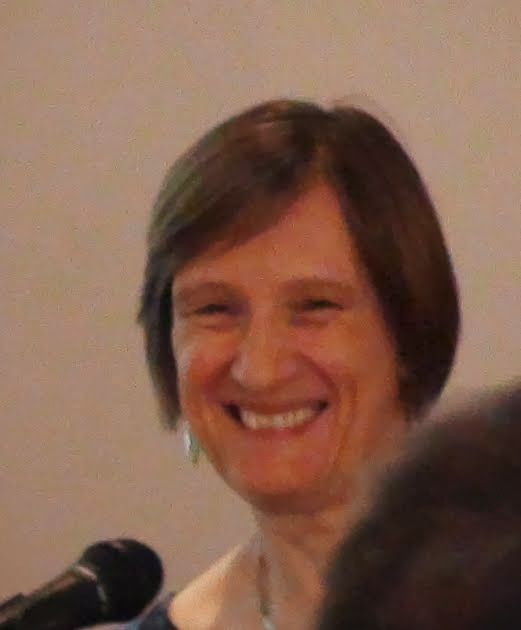 In the afternoon Anna Mieczakowski presented the findings of the recent booklet on inclusive design Ageing, Adaption and Accessibility that she and John Clarkson had published. COBALT’s second event was at Edinburgh. 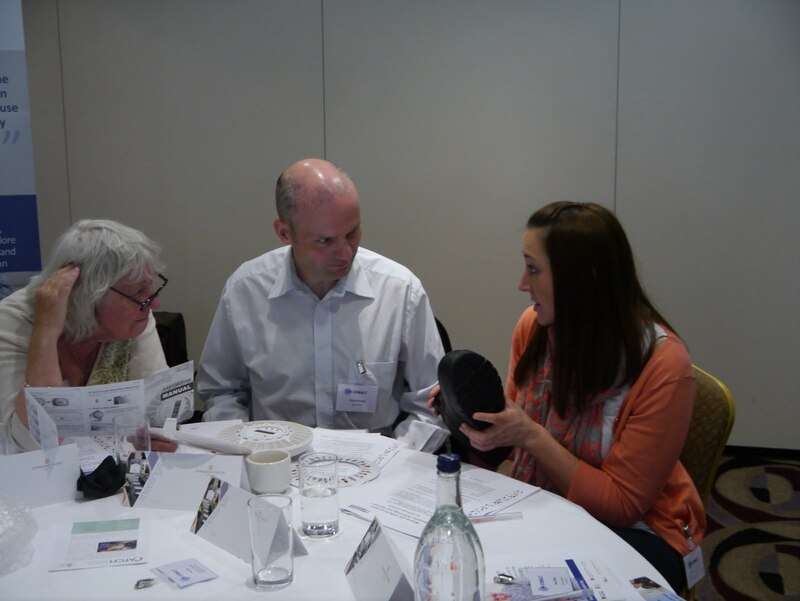 We arranged for delegates to try out a range of assistive living devices. 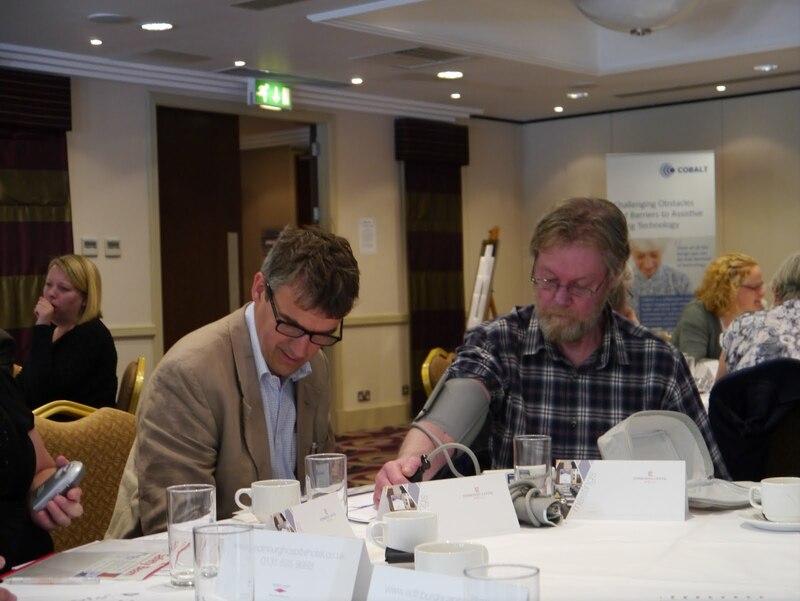 Some, like the blood pressure cuff were very similar to clinical devices. Other devices like the GPS tracking shoes were very innovative. 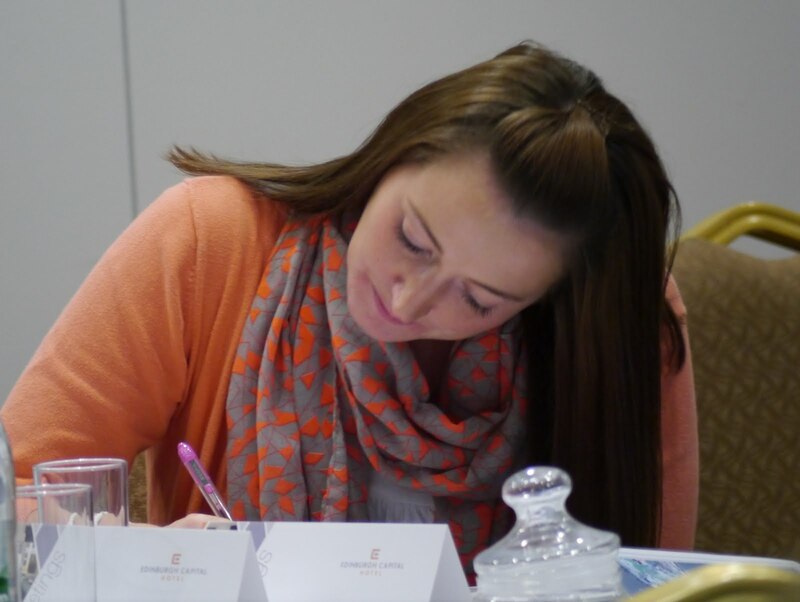 Finally delegates were encouraged to write an action plan that they could take back to their home or work. 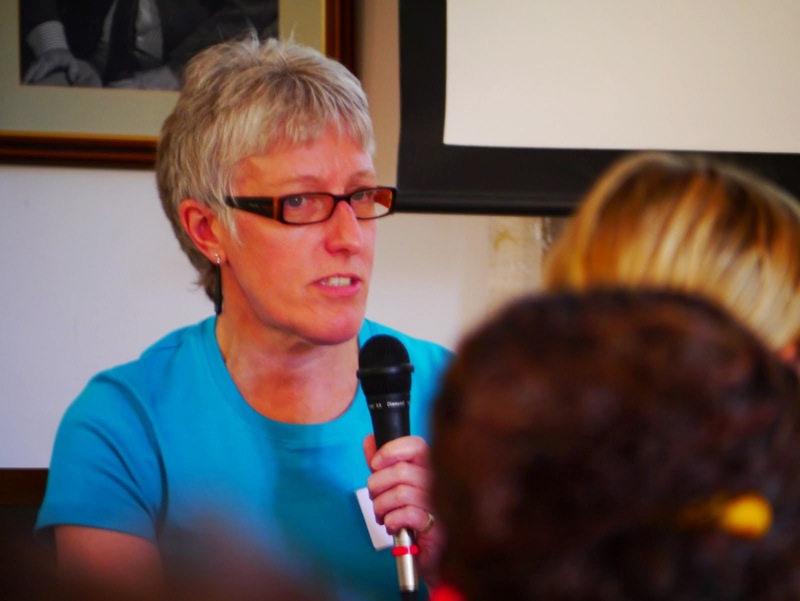 Click Age Scotland for Doug Anthoney’s report on the conference. 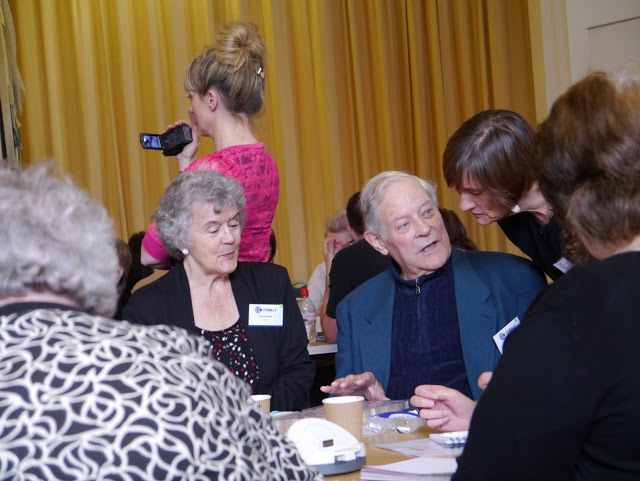 We had 55 attendees including older adults, health and social care staff, academics, third sector workers such as Age UK, assistive living technology (ALT) industry members and commissioning staff from the NHS and City Councils. 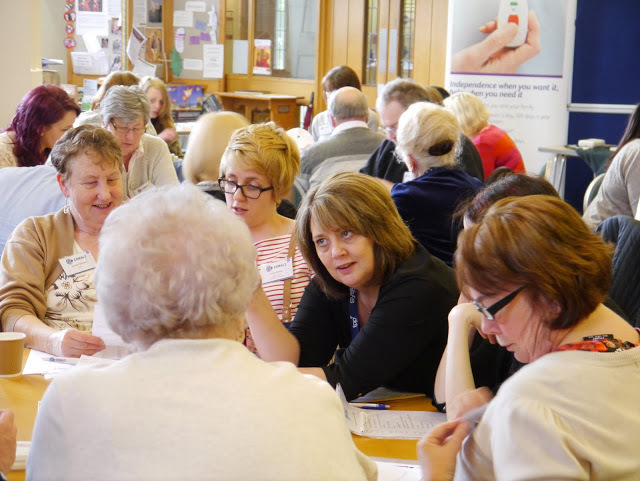 The day started with a Technology Interaction session where we asked attendees to work in pairs and use an item of ALT that ourselves and Docobo, City Wide Care Alarms, Simpla Solutions and Age UK Personal Alarms had supplied. 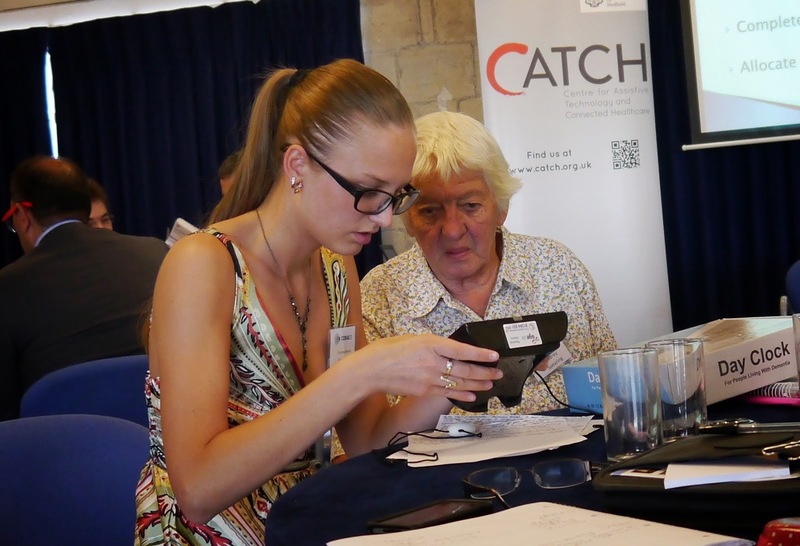 Attendees fed-back that they particularly saw a use for medication devices such as pill dispensers and the pill popper as well as the Docobo Care Portal to monitor their own health. 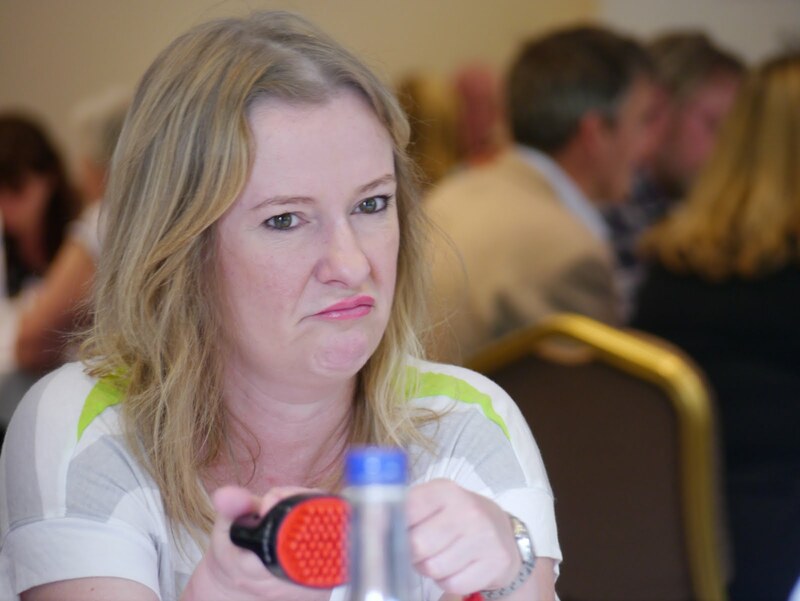 The themes that came out of this session were that personalisation is key and that a try before you buy scheme is something people would like to see. 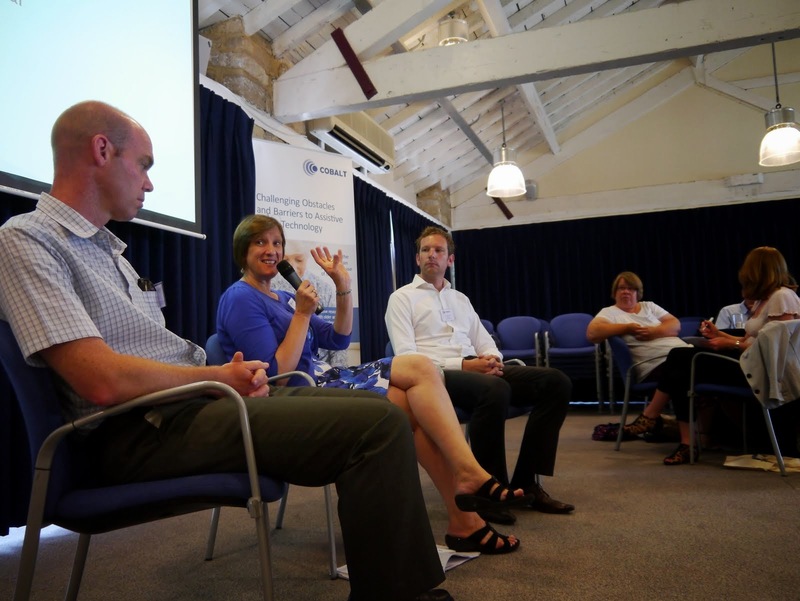 Following this there was a Q&A panel with Steven Haigh from the Right First Time Programme and Jayne Stocks, Clinical Lead for Assistive Technology at Sheffield Teaching Hospitals NHS Trust which provoked a lively debate. 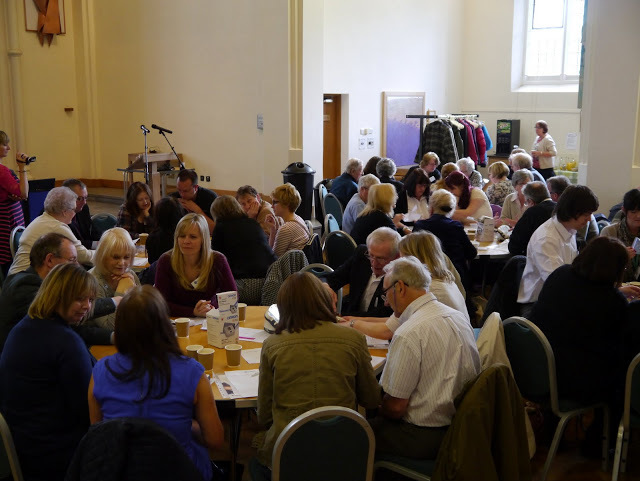 We then had an activity around service re-design where attendees suggested a community hub, trial service and local ALT champion as changes they would like to see. 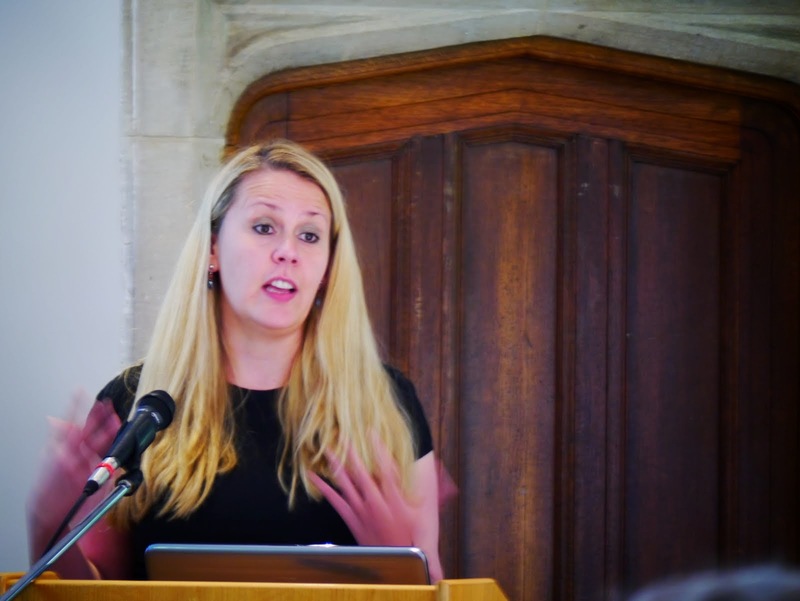 On the afternoon session there was a presentation by Claire Bentley, Research Associate on the Barriers to Telecare project at the University of Sheffield’s School of Health and Related Research (ScHARR). 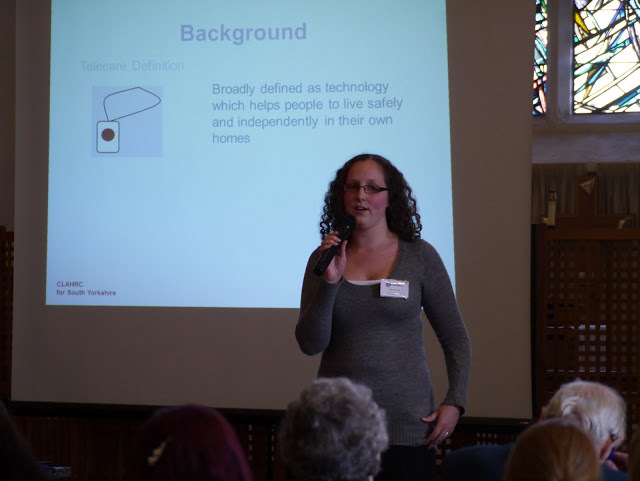 Claire discussed some of the findings from the project which has used interviews with people who are not currently telecare users including issues around cost, stigma and awareness of which telecare products are available. 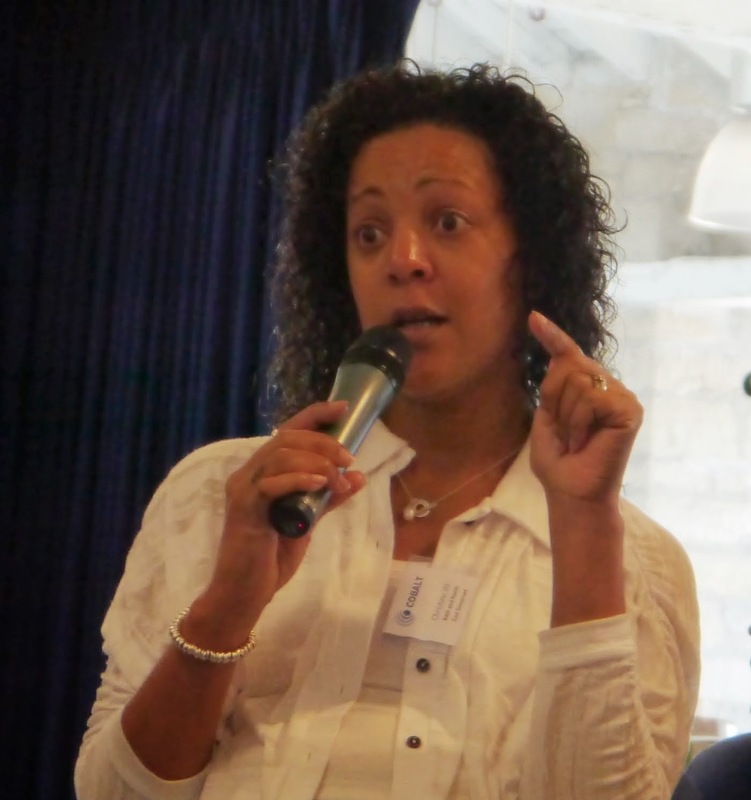 We then had a Q&A with one of our Pioneer Group participants. 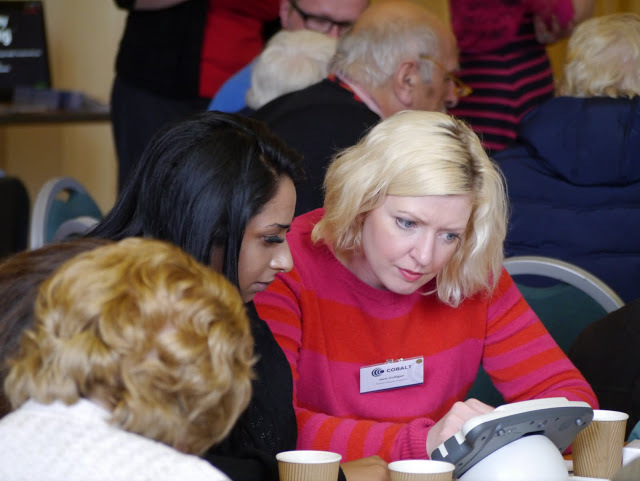 She was more open to technology because of the group and that we should harness things such as telecare than can help as we get older. Finally we had an action planning activity where attendees detailed what they would do as a result of the day. 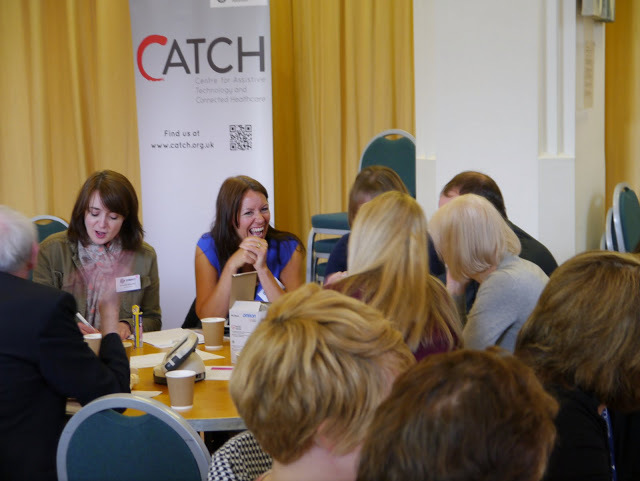 These included collaborating with people they had met on the day and researching new technologies for themselves and service users. 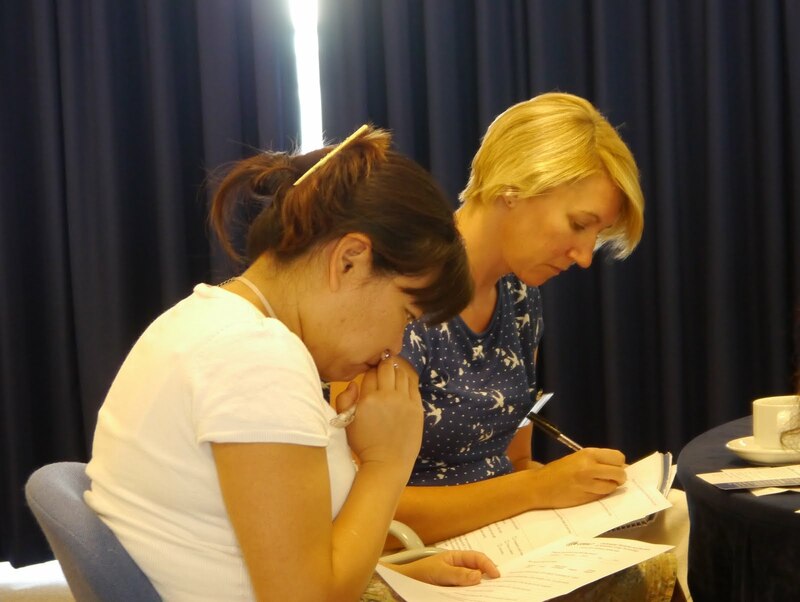 Before the summary of the day attendees completed feedback forms which were overwhelmingly positive. 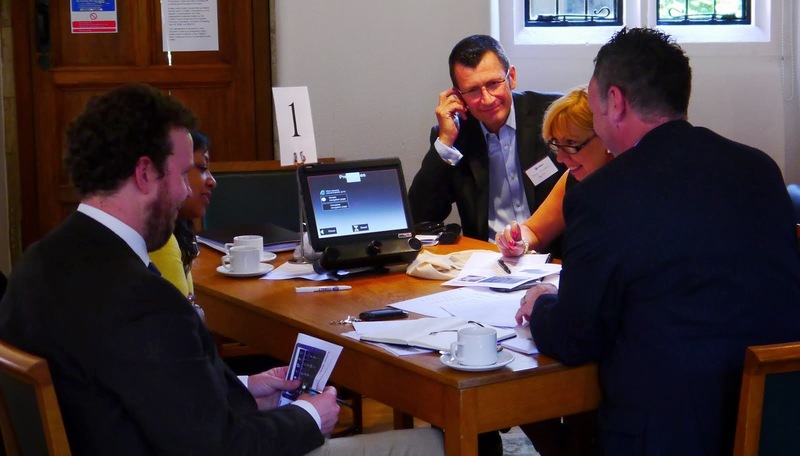 The main theme for positive feedback was that the day had been a great networking opportunity which had given attendees the potential to work together. This was fantastic considering the main aim of the day was to bring people together to overcome the barrier to ALT adoption of lack of service integration. 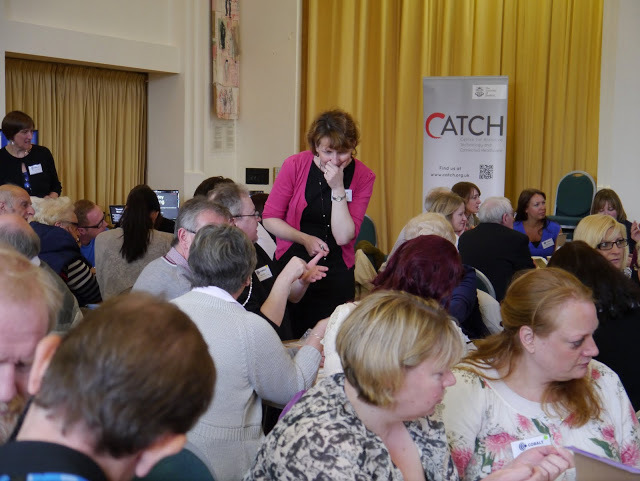 The next step is to replicate the success of this event in Swindon (13th June), Edinburgh (20th June) and Cambridge (11th July). To book your place please email Dr. Maggie Ellis on mpe2@st-andrews.ac.uk. Hello all. Here I am again after another extended break. Dr Maggie still visits me and on her latest visit the task was for me to relearn how to use a memory stick. Some years ago, before I was diagnosed with Dementia, I would use a memory stick probably every day and it was invaluable to me in my employment. Alas all those memories have completely gone and it only with the patience of Dr Maggie that I have managed to get back to the stage I am at now. Originally when I first met Dr Maggie she had to go back to the very beginning with me and start with very easy to understand tasks on my computer. She did not mind that it usually took very repetitive instructions over a period of weeks and months before I finally got it. Anyone who has read my previous Blogs will know how difficult things were for me after I was diagnosed. That was three years ago and I am still in the early stage of my Dementia. I spoke with my Consultant last week and he was delighted to hear how successful Dr Maggie has been in such a short time. To be honest, he looked astonished when I demonstrated the use of my I.Phone. Before I was asked to take part in COBALT I had very little interest in re-learning or in fact learning something new. I thought those days had passed me by. It also took me into a completely new place. 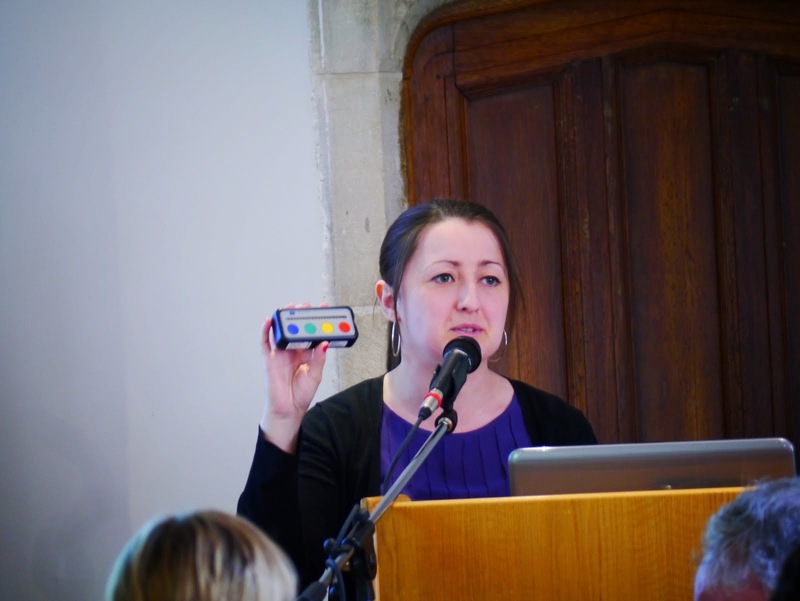 I was transferring my new technology skills into writing presentations and going on to actually deliver them to some well attended Conferences. This was down to Dr Maggie and the confidence she had in me. I am always delighted to discuss COBALT with anyone who will listen. I am equally delighted when I am asked to make public presentations but only with the knowledge that usually Dr Maggie is close by. 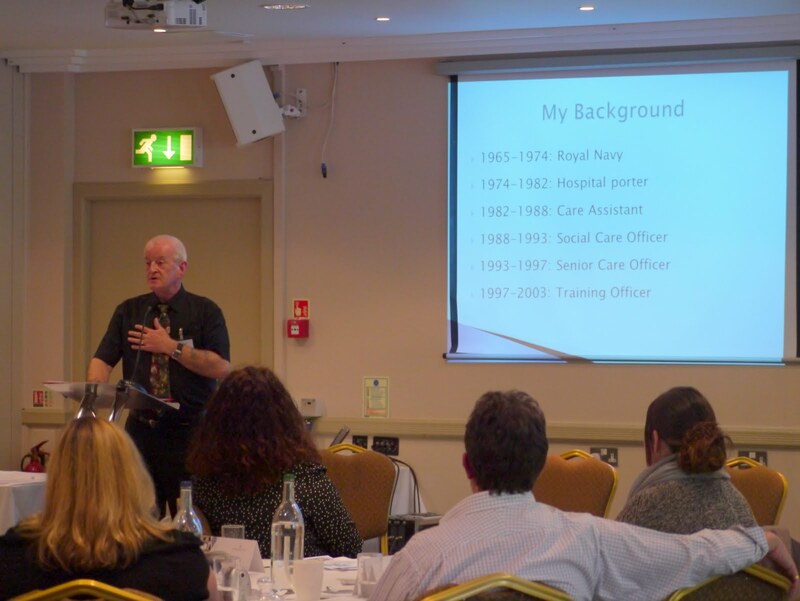 All this learning and re-learning has brought about the opportunity for me to be extended the honour of attending the Alzheimer Europe Conference and delivering a Presentation to this influential body. I will be representing The Scottish Dementia Working Group on this occasion and will be given the opportunity to further their aims. By a stroke of good luck the Conference is to be held in Malta, so I am also getting the added bonus of having some time in the sun. I think it goes without saying but I will anyway. Thank you Dr Maggie Ellis. Hello again. I have not been posting any blogs recently for two reasons. Firstly I really needed a long break. Also, my service provider completely changed my mail settings and this confused me quite a lot. When Doctor Maggie came to see me last week she very carefully demonstrated to me how to operate the new system. Obviously I am very reliant on Doctor Maggie’s assistance when something like this happens. I think I have said before that occasionally I will have these “temporary blips” but when they happen now I know help is at hand. I had also become aware recently that I was getting into some difficulty using my i.Phone. My Internet was dead slow to stop. I searched out all the previous written instructions that Dr. Maggie had given to me and soon found the answer. My BT Home Hub connection had become loose at my desk top computer. I followed the instructions and was soon back on-line. This confirmed that all those times Dr. Maggie told me to record everything was proving to be very good advice. I am still a compulsive button pusher when it comes to all kinds of technology, but on most occasions I can get myself out of trouble. I must admit it becomes a bit awkward when I am feeding information into the Sat-Nav. My wife S tends to ignore my suggested routes and usually she drives to our intended destination without my help. This week I am being re-trained in our kitchen. S has been concentrating on my use of our Micro-Wave Cooker. Something I used to find incredibly simple before my diagnosis has become a major risk in our household. I thought it was well within my grasp to use it without any problems but that proved to be incorrect. S has become used to leaving A4 notes with a definite instruction saying “DO NOT USE”. With a lot of patience, S is doing a great job and I am slowly getting the idea of safety in the kitchen. S recently requested the Fire Service to come and assess our home. This was done and we are both more comfortable with the situation. They have given us a very personalised written assessment which will link up to my Community Alarm and Smoke and Exit Alarm. I am now very comfortable with the technology that has been put into place in our house for our continued safety. I feel very proud and honoured that Dr. Maggie has invited me to give a Presentation at The Dissemination Conference of the COBALT Project in three months. That is the easy part. The more difficult thing is. How can I possibly say thank you to Dr. Maggie for her help and incredible patience during the last six months. It is my intention to continue writing the Blogs in the future and thank you for taking the time to read them. Come along to one of our free events! COBALT is undertaking a series of exciting events to share our findings and to showcase our novel research techniques. Stakeholders including older adults, health & social care professionals, commissioners, policy makers, charities, local agencies and other interested parties are warmly invited. All events are free and refreshments are provided. Booking is advised. To book your place please email Dr. Maggie Ellis @mpe-2@st-andrews.ac.uk or ring her on 01334 462017.